The combating of religious discrimination is one of the oldest thematic topics of discussion within the UN human rights system. Originally bound closely with discussions on racial discrimination, particularly in the context of resurgent anti-Semitism in the aftermath of World War 2, it harks back to the mandate first handed the Commission on Human Rights by the Economic and Social Council (ECOSOC) upon the former’s creation in February 1946. Compared to progress made on other forms of discrimination by the UN system, development of a framework for dealing with religious intolerance was, at first, slow, meandering and above all, defined by two schisms 40 years apart. Despite this, developments in the past decade offer the potential for newfound consensus on the interaction between religion and human rights that would have previously been unthinkable. The first schism came in 1962 when the discussion on religious intolerance was split from racial discrimination. At the General Assembly’s 17th Session, Central African Republic, Chad, Mali and a group of former French colonies, built upon the suggestion of a sub-commission for Human Rights for a GA resolution on ‘manifestations of racial prejudice, and national and religious intolerance’, with their proposal of a draft convention. Crucially, however, their proposed draft convention focused on only one aspect of the sub-commission’s recommendation, that is the elimination of all forms of racial discrimination. This, in time, would become the ICERD and helped spawn a wide range of jurisprudence across national and regional jurisdictions dealing with racism, hate speech and hate crimes. After much debate and opposition, notably from the Communist bloc, Saudi Arabia, Egypt and Tunisia, a second resolution was adopted by the GA on 7 December 1962 calling for the ‘preparation of a draft declaration & convention on the elimination of all forms of religious intolerance’. Unlike the CERD, however, this draft convention suffered a failure to launch and its negotiation, lacking momentum and increasingly polarized, eventually stalled; falling victim to, amongst other things, the geopolitical aftershock of the 1967 6-Day War. As the Soviet Union maneuvered to further ally with Arab states, it secured revisions to the convention which undermined it as a whole, negotiations being subsequently deferred until they were formally halted entirely in 1972. This has caused it to become something of a ‘lost covenant’. Progress was instead relegated to an eventual and relatively unknown UN declaration and, from 1986, the reports of a Special Rapporteur mandated by the Commission on Human Rights. This led directly to the second schism at the turn of the 21st Century. In 2000 Ireland, at the suggestion of the then Special Rapporteur, presented a resolution to the Commission on Human Rights, changing the title of his mandate from ‘religious intolerance’ to ‘freedom of religion or belief’, wishing to focus more on the positive aspects of the mandate. Simultaneously, Pakistan on behalf of the OIC developed a concept it had introduced to the Commission a year prior, the ‘defamation of all religions’. This was a resolution which sought to combat negative stereotyping of religions, predominantly Islam, by applying restrictions on individuals’ freedom of expression. The text was problematic for many, specifically in its use of the concept of defamation as applying to something so ill-defined and abstract as religion and the implicit argument that religions therefore had ‘rights’. It also lay uncomfortably close for some to a blasphemy law in all but name. Nevertheless, the text was passed via consensus the first two times it was presented, mostly as a gesture of goodwill from the EU & US. By the third time, however, the OIC sought to table a text that urged states to provide concrete ‘protection against all human rights violations resulting from defamation of religions’. This proved a bridge too far for a consensus that was already all-but eroded. The text was put to a vote then and every time it was presented thereafter. Resultingly, the discussion on religious discrimination within the UN system was split between two competing resolutions; the Freedom of Religion approach, which was championed by the EU, US and other ‘western states’ and the concept of Defamation of Religion, argued by the OIC. Support has, over time, waned for the position of the OIC – the last time they presented the resolution was in 2010 where it passed by a margin of just 3 votes. In this context of the ebbing support for the initiative in both New York and Geneva, the murder of two prominent Pakistani politicians for their perceived opposition to the country’s blasphemy laws catalysed a change in position from the OIC as a whole. There was now a cross-regional will to move past divisive abstract argument and find a workable common ground for identifying an anti-discrimination framework for religion at the UN. 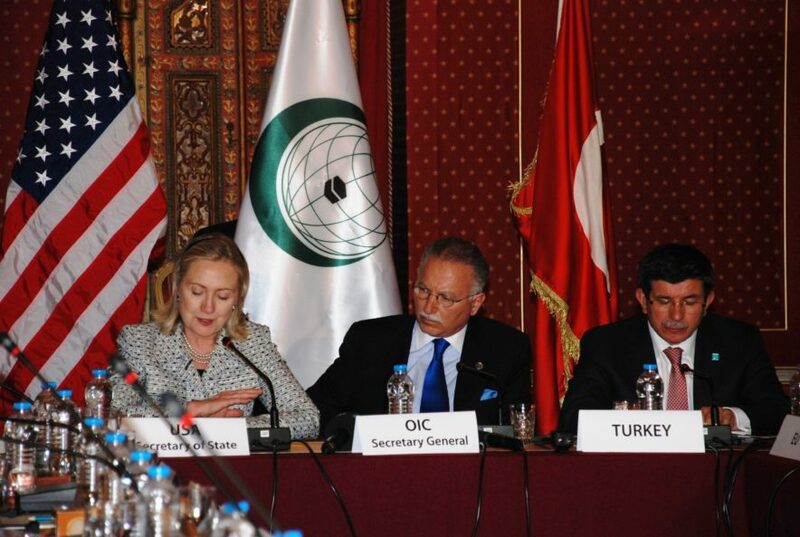 At HRC15, in September 2010, an 8-point plan was presented by the then Secretary General of the OIC, promoting , inter alia, dialogue and the criminalisation of incitement to imminent violence based on religion and combat religious stereotyping while acknowledging ‘that the open, constructive and respectful debate of ideas […] can play a positive role’. This then formed the basis of a resolution presented by Pakistan at HRC16, which was passed by consensus and has since formed the sole policy framework for all subsequent negotiation on the issue of religious intolerance within the UN system – Resolution 16/18. It is interesting to note the legal conception of what could be considered a justifiable restriction on the right to freedom of expression that was assumed in the OIC’s position is, almost word for word, that of the famously strict US constitutional precedent Brandenburg v. Ohio (1969). This case, which echoes the US’s interpretation of Article 19 of the ICCPR and their position on freedom of expression in global fora more generally, states that all speech is permitted – save that which is an imminent incitement to unlawful action, such as violence. Its appearance in the eventual compromise position is, in some ways, of little surprise, given that the US was a key negotiator of the resolution via then US Secretary of State Hillary Clinton. Yet, this ignores what was in fact a landmark achievement. This change represented a huge departure from the previous OIC negotiating position that had been assumed for 40 years, still implicit in the ‘Defamation of Religion’ resolution: that ‘criticism of religious beliefs [leads] to religious intolerance,’ and that ‘from the point of view of Islam, criticism of religions [is] not acceptable’. Worth noting is that while the ‘battle’ over freedom of expression is usually couched in the terms of the ‘West’ versus the OIC, the compromise is appears reflective only of the US position. Many European states had, at this point, a judicial tradition of hate speech laws which criminalised certain discriminatory expressions of free speech (usually racism) for decades. The discarding of a position which places religions on a pedestal and insulates them from criticism is of course to be welcomed, especially while these remain a buttress for blasphemy laws. Nevertheless it is arguable that this was an over-compromise in favour of the US’s interpretation of Article 19 of the ICCPR at the expense of very little recognition for Article 20 of the ICCPR (Prohibition on advocacy of racial and religious hatred). By not drawing upon the experience of more nuanced discrimination jurisprudence, the stage was set for future difficulties. Following on from the historic agreement of the 16/18 framework, the OIC hosted a ministerial meeting in Istanbul on 15 July 2011 creating the ‘Istanbul Process’. In principle, the Istanbul process is a unique strength of the 16/18 framework, which calls for annual meetings with political and practitioner level stakeholders on the implementation of the resolution – the only HRC resolution with such a process. It was to act as a forum for the exchange of good practices and the development of strong national implementation. In practice, there has been anecdotal evidence presented at meetings of the process that state practices are evolving in line 16/18. Indonesia, Argentina and the UK among others have all taken action in line with its implementation. This is in-of-itself an impressive feat. Yet progress remains inconsistent. The fault lines of the compromise underpinning agreement between the OIC and the EU glimpsed in the aftermath of 16/18, though mostly dormant, still exist. The Rabat Plan of Action, led by the OHCHR and building up the work of the treaty bodies sought, to bridge the divide between the conflicting notions of Articles 19 & 20 of the ICCPR. Despite creating a platform of promising avenues for future discussion, it hasn’t moved the conversation between states forward. The ‘West’ still sticks to the line of overriding freedom of expression; avoiding what is seen as ‘political’ discussions on the limits of Article 19 ICCPR. The OIC by contrast appear to want the Istanbul process to provide a forum for focused discussion on paragraph 5(f) of 16/18, the divisive topic of criminilisation of incitement. On this front there remains an impasse. Which brings us to today, over 70 years since discussions began on a UN framework on the prevention of religious intolerance, 40 years since a forgotten declaration and 8 years since the adoption of 16/18 and the creation of the Istanbul process. The consensus around the framework remains fragile and thereby the status-quo prevails. There is an implicit agreement that the OIC will keep the language and scope of the annual ‘16/18’ resolution in suspended animation in exchange for the same from the EU on ‘Freedom of Religious Belief’. This is problematic, as in theory they are the positive and negative expressions of core rights and could be expressed in a single resolution; in practice either side fears opening their text for amendments would open the floodgates. As both the OIC and EU are already collaborating closely to keep both resolutions on track, a temporary stopgap could be biennialising and staggering the resolutions, to emphasize their complementary rather than competing nature. Concurrently there seems to be a current lack of interest in making headway on the Istanbul process. Medium-term, moving the conversation forward could involve discussions which move religious discrimination from being constrained by the ‘immediate incitement to violence’ as a minimum threshold for derogation from freedom of expression to one where it is the maximal infraction of anti-discrimination legislation informed by the past half century of experience with the ICERD, ICCPR and hate speech laws. This may promise a third path that is neither a prop for demagoguery, nor a blasphemy law by any other name. Before any developments can occur, however, the entire process needs to be roused from stasis. The last meeting of the Istanbul Process occurred two and a half years ago in Singapore; the last meeting hosted by a Western State was in London in 2012. The process is therefore currently open to being undermined by suggestions that Western States are not serious about implementing the 16/18 action plan. With that in mind, seizing the initiative and restarting Istanbul discussions would be a good place to start.